The next OrderFire is a DrinkOrder! Our next OrderFire screening, on Sunday October 14th, is going be a DrinkOrder! 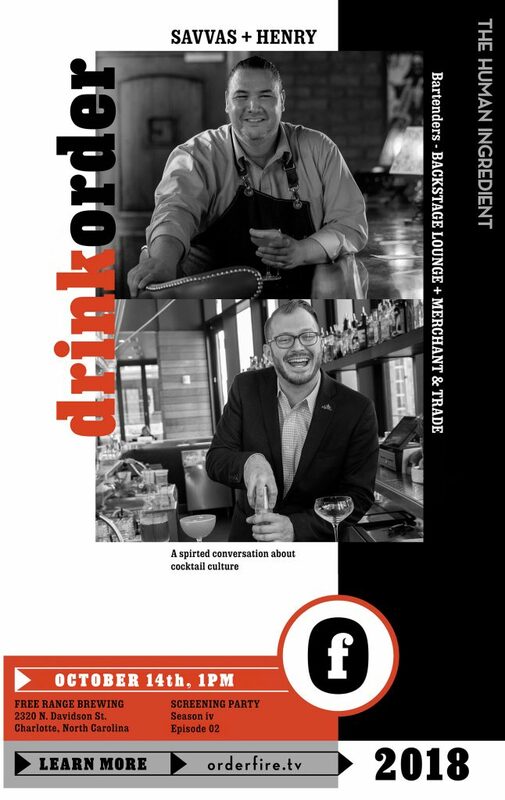 DrinkOrder’s host Bob Peters sits down with Savvas Punsalan of the Backstage Lounge and Henry Schmulling of Merchant & Trade! Both of these gentlemen are helping to shape the way Charlotte is drinking cocktails and enriching our culinary scene. Please join us at Free Range Brewing on Sunday Oct. 14th at 12pm for the social hour where there will be cocktail samplings from each of the bartenders and the screening will play at 1pm! There will also be a raffle supporting the Hospitality House of Charlotte.